I hope you all had a great weekend! Here’s a look I wore last week to a few meetings for an exciting project I’m working on. I can’t wait to tell you more about it! This sleek Rag and Bone vest is the perfect layering piece if you’re going for a chic, sophisticated look. Love the gray and black together! Such a chic and polished look! Wow!! You look like a rock star, superb outfit from head to toe!! I like your bag and sunnies very much! I am loving the all black and grey look. It’s so sophisticated! Love your outfit! I’ve been looking for a vest like yours. Great pick! goes perfectly with the leather leggings. I love that vest! Such a great layering piece! Merry Christmas & have a safe holiday. Wow, amazing look! You look mysterious, but yet elegant. I love the vest! great outfit! This grey looks amazing on you! 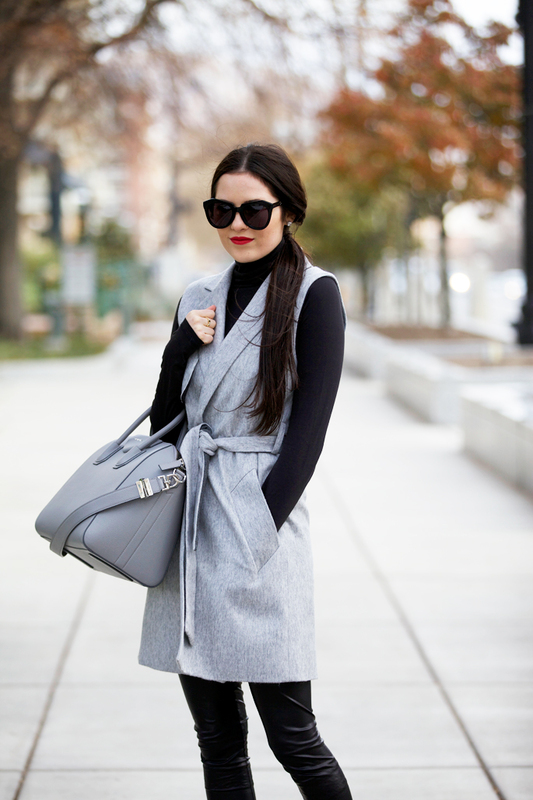 The mix of grey and black is so chic and effortless! Amazing outfit. 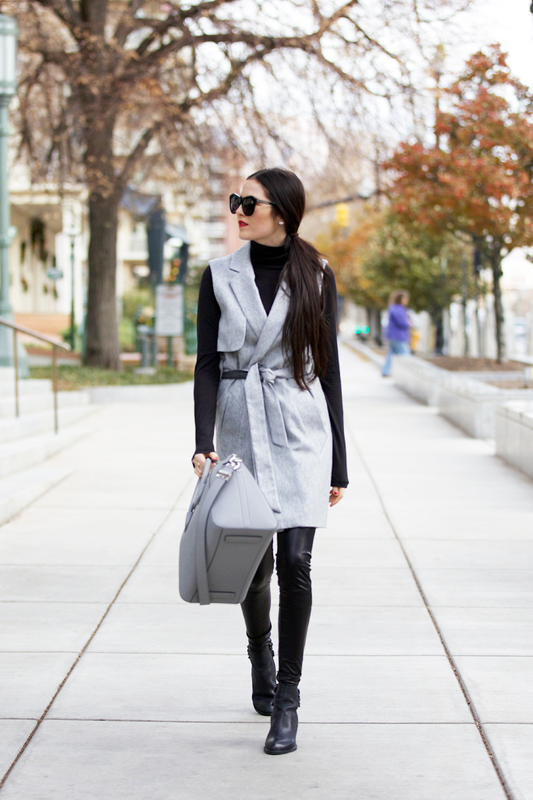 You titled and styled this outfit post perfectly… looooving the grey vest coat!! Love his black and grey look. That long vest is perfection! 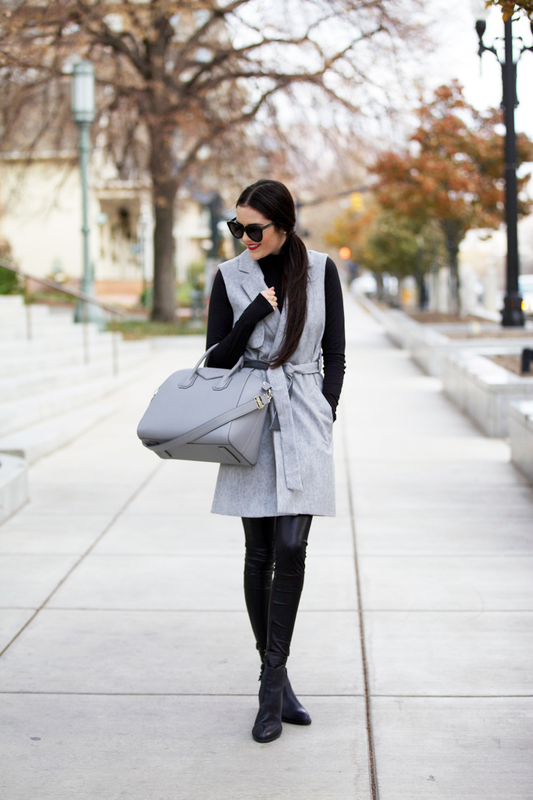 Loving this grey and black outfit! That vest is definitely a needed item in the closet! I love that sleek black turtleneck…I need to get one of those! Ugh, that vest is amazing! Love it with that Givenchy bag! Always so pretty and chic!! Love this vest! Loving the leather. That bag is too chic too. Loving that gorgeous rag & bone vest! I love the vest! Great look! That vest is amazing! Love how you styled it. Can’t wait to hear about the upcoming project! Love how you matched the sleeveless coat with the bag! I do love the vest and grey bag! Very nice! Love this look – so simple and chic! I love Rag & Bone they make the cutest winter clothes. that outfit is just so on point. This is such a great look! Love that vest! Super, super chic!! I love the black and grey. Love this look! The grey and the black look so sleek together. I love your coat! The colour is perfect! This is such a chic piece! Loving your style lately. So posh! Nice grey and black combo. So chic. Love this combo!! That vest is so beautiful, I have always been such a lover of Rag & Bone! Such great clean tailoring and style!! So gorgeous darling! Adore this! Beautiful look!Love the gray vest! Another “exciting project” like that jewelry collection that tanked! Very chic yet professional monochromatic look! Love the vest, it’s so cool and sleek! I love that bag. Always so chic! Love the grey coat, so chic! Perfect title to describe this look!! That vest! Sophisticated, chic, and a bit of edge with the leather leggings and those boots. Your hairstyle matches the look perfectly. That vest is to die for!